Farm Animal Rescue: We rescue and give sanctuary to vulnerable farm animals in need of a second chance and a peaceful place to live out their lives. We give them a safe place where they can be themselves and provide them with a lifetime of shelter, love, food and medical care as needed. Humane Education: We promote respect and compassion for all beings and educate and demonstrate a plant-based lifestyle to help heal our planet and our community. 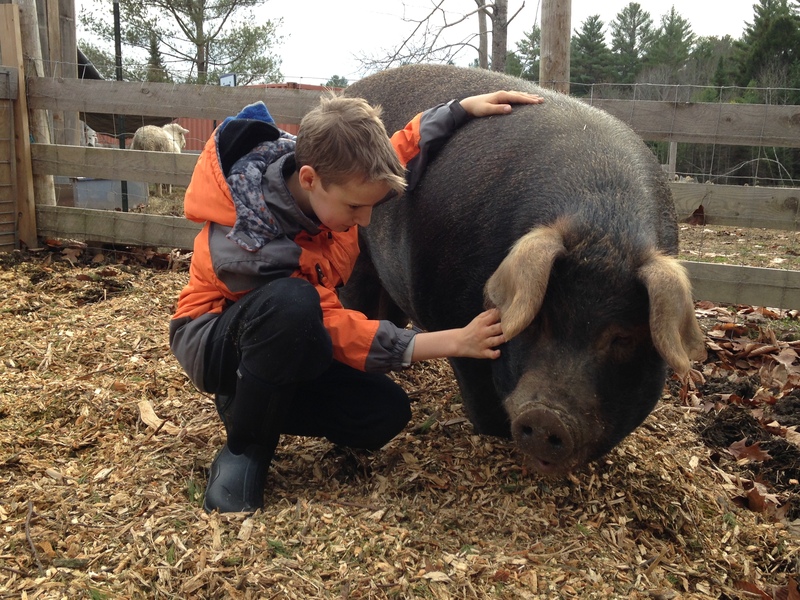 Our humane education activities are based on a mission to teach young people in our community that all vulnerable beings — cat, dog, pig, sheep or human — deserve our respect and our compassion. Volunteer Activities: We offer work parties throughout the Spring, Summer, and Fall and have many open opportunities for anyone interested in helping out. If you believe in our mission, have free time and a desire to be of service, we encourage you to fill out a volunteer application or email us for more information. Care Farm: By allowing vulnerable people in our community to come experience and participate in selective activities on our farm, we demonstrate and promote a truly compassionate lifestyle that mutually benefits farm animals and people in our community.